Last night I checked a few books out from a library. 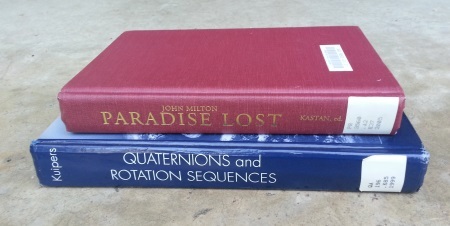 One was Milton’s Paradise Lost and another was Kuipers’ Quaternions and Rotation Sequences. I didn’t expect any connection between these two books, but there is one. When I see quaternion I naturally think of Hamilton’s extension of the complex numbers, discovered in 1843. Paradise Lost, however, was published in 1667. Milton uses quaternion to refer to the four elements of antiquity: air, earth, water, and fire. The last three are “the eldest birth of nature’s womb” because they are mentioned in Genesis before air is mentioned. Cool! For more fun, find the word “quaternion” in the King James Bible! Acts 12:4! I had no idea before you mentioned it and I searched for it. Wikipedia lists three non-mathematical uses, but doesn’t list Milton’s or Luke’s use of the word. The book “Vectors” by Moon and Spencer (1964) has a great introductory chapter about the history of complex numbers, quaternions, and vectors. Vectors were seen as low-brow by the supporters of quaternions, but which one is a quaint mathematical oddity now? 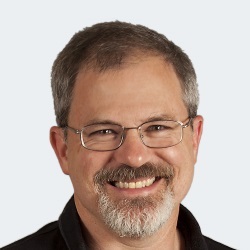 Hmm… let me see… i j k + K J V = mathematical kabbala? Have fun with Paradise Lost. I’ve tried at around five separate occasions to read it and at best got half way through. It’s dense and difficult. But that’s probably true of Quaternions and Rotation Sequences, as well.